Locate the smallest patch, i.e. the patch of size 1x2, and place the neutral token between this patch and the next patch in clockwise order. Place the special patches on the marked spaces of the time board. 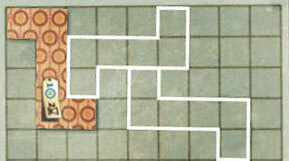 In this game, you do not necessarily alternate between turns. The player whose time token is the furthest behind on the time board takes his turn. This may result in a player taking multiple turns in a row before his opponent can take one. 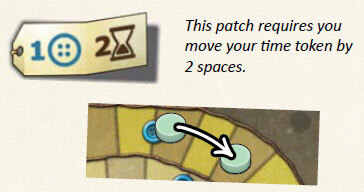 If both time tokens are on the same space, the player whose token is on top goes first. Move your time token on the time board so that it occupies the space directly in front of your opponent's time token. You receive 1 button (i.e. a button tile of value 1) per space you moved your time token. You can choose from the three patches in front of the neutral token (in clockwise order). Place the neutral token next to the chosen patch. Pay the depicted number of buttons to the supply. 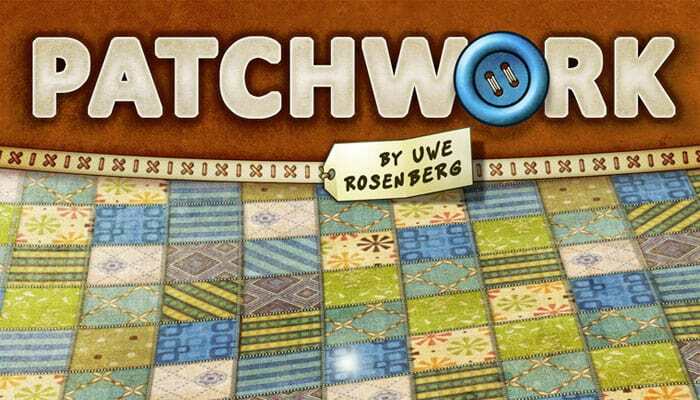 The patches on your quilt board may not overlap. 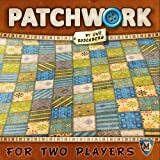 You may turn the patch any way you like before placing it on your quilt board. Move your time token on the time board by a number of spaces as depicted on the label. If your time token ends up on the same space as your opponent's time token, place your token on top of it. Take the special patch and place it on your quilt board immediately. The special patches are the only way to "patch" single spaces of your quilt board. 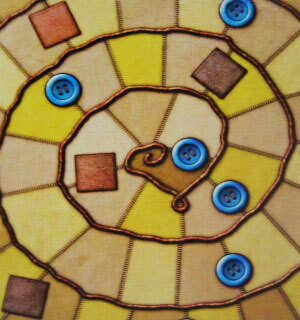 You receive a number of buttons according to the patches on your quilt board. The first player to completely fill a 7x7 square of spaces on his quilt board receives the special tile, which is worth 7 points. The game ends aft er both time tokens reach the last space of the time board. If a time token were to move past the last space, it simply stops on the last space. In case of action A, you only receive buttons for the actual number of spaces moved. Determine the number of buttons you have left , adding the value of the special tile if available. From this score, subtract 2 points for each empty space of your quilt board. The player with the highest score wins. In case of a ti e, the player who got to the final space of the time board first wins.